The HRA is a public non profit entity. All funds donated will be used in creating housing and community development opportunities and is 100% tax deductible! Do you need assistance paying your rent? Rent and utilities take a large portion of a household's monthly income. If you are paying more than 30% of your gross income towards rent and utilities, it's hard to make ends meet. We may be able to help. The first step is to complete an application. Mail (do not e-mail or fax due to sensitive information) your complete application to PO Box 128 | Mentor, MN 56736. You will receive a letter letting you know if your application is pre-approved. Be sure to notify us if you have a change in address. For a fillable version of this form, you can download a fillable version here. Please use Adobe Acrobat or your Google Chrome Browser to ensure a complete application. For a printable version of this form, you can download a PDF version here. This form works best in Google Chrome. We do not recommend using Firefox or MS Edge. The Section 8 Rental Assistance Program can help you pay your rent if you are income eligible. Eligible families and individuals select their own rental units, and pay 30% to 40% of their adjusted gross income towards rent and utilities. Northwest Minnesota Multi-County HRA pays the balance of the rent. Check out our FAQ for more information about Rent Assistance! The Section 8 Housing Choice Voucher Program is a subsidized rental assistance program funded by the U.S. Department of HUD. How do I qualify for a voucher? 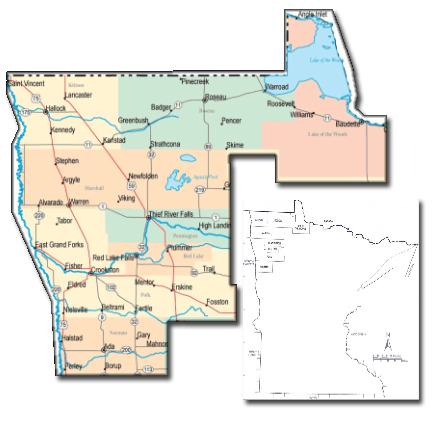 The Northwest Minnesota Multi County HRA service area includes eight counties in Northwest Minnesota: Kittson, Marshall, Norman, Pennington, Polk (with limited availability city of Crookston), Red Lake, Roseau and Lake of the Woods. Self sufficiency services are available to our Public Housing tenants. These services enable participating families to increase earned income, reduce or eliminate the need for welfare assistance, make progress toward achieving economic independence and housing self sufficiency, or, in the case of elderly or disabled residents, help improve living conditions and enable residents to age-in-place. Contact Barbara at 218-637-2431 for more information. Section 3 of the Housing and Urban Development Act of 1968 (12 U.S.C. 1701u) (as amended), requires that economic opportunities generated by certain HUD financial assistance for housing (including Public and Indian Housing) and community development programs shall, to the greatest extent feasible, be given to low and very low-income persons, particularly those who are recipients of government assistance for housing, and to businesses that provide economic opportunities for these persons. Who are Section 3 residents? Public housing residents including persons with disabilities and low and very low income persons who live in the area where a HUD assisted project is located. What is a Section 3 Business? A Section 3 business is one that is owned by section 3 residents, employs Section 3 residents or subcontracts with businesses that provide opportunities to low and very low income persons. For more information about Section 3 opportunities, please contact the office at 218-637-2431. Landords are needed to provide good quality housing. If you are interested in finding out how the Housing Choice Voucher HCV Program works, we are here to help. Listed below are links to our Owner's Manual, HCV Fact Sheet from the U.S. Department of HUD, and the MN Publication of Landlord/Tenant Rights and Responsibilities. Contact our office for specific questions. In the Section 8 Homeownership program, the HRA payments go towards making a participant's mortgage payment rather than towards rent assistance payments. The program is open to participants who have been on the voucher program for at least one year and are on the Family Self-Sufficiency program or are disabled. To get on this program the family must be issued a Homeownership voucher. To get a Homeownership voucher a family must be employed for a year, make a certain amount of money each year and be a first time home buyer. Disabled families are given certain exemptions (i.e. do not need to be employed). To determine the requirements of Section 8 Home Ownership, click here. Useful Links | Fair Housing Copyright © NWMNHRA. All Rights Reserved.